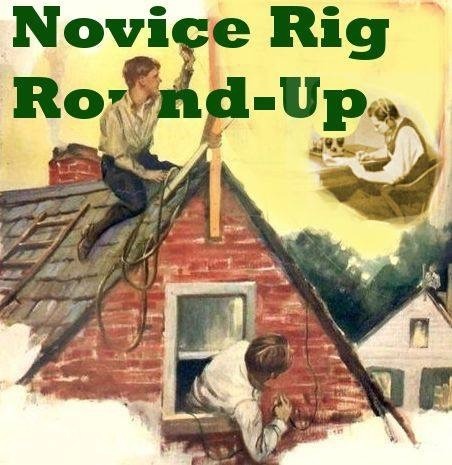 THANK YOU for a great 2019 Novice Rig Roundup! We Thank Our Sponsors, Prize Donors and Supporters! In Partnership with ELECTRIC RADIO Magazine, QST Magazine, CQ Magazine, National Contest Journal, QCWA Journal etc. does NOT register you for the 2019 Roundup. Your NRR Membership Number NEVER expires! Please Consider Donations to Novice Rig Roundup to help defray the costs of web hosting, mailing and printing. good in QRZ.com or at wm7d.net - his call sign, W7PAZ. to have very successful Novice Rig Roundups! From 0000Z March 2, 2019 though 2359Z on March 10, 2019. 144.085 and 144.450MHz CW and AM where allowed. Literally anywhere that you have a crystal for, of course! Operate CW anywhere that it is legal for your license class in these 5 bands. USE OF NOVICE ERA Frequencies suggested where possible. IF YOU'RE CQing,DON'T FORGET TO SCAN RECEIVE UP AND DOWN A BIT. A ROCK-BOUND STATION MAY BE RETURNING YOUR CALL! CW/A1. Use of mechanical keying is encouraged, but certainly not mandatory. So just have QSOs with other folks and exchange info about your stations. All the logger requires is the DAY/DATE, CALL, NAME, BAND, QTH and YOUR RIG. in light red on the logger screen. Only the FIRST QSO with another station will be scored. You do not need to enter QSO data in real time; you can go back at the end of the event and enter data from a paper log. ALL SCORE IS COMPUTED BY LOGGER. SIMPLY LOG IT CORRECTLY, AND THE LOGGER DOES THE REST. YOU WILL NOT ENTER THE OTHER STATION'S RIG INFO OR CLASS. contribute to the score. Only the FIRST QSO will be scored, any dupe, highlighted in pink, will not count. contacts is approved and highly encouraged for NRR. Award certificates to top scoring stations. Will be awarded by drawing. DISCOUNT TUBES for Novice Rig Roundup Members! Folks, Mike offers a 10% discount to Novice Rig Roundup members! Be sure to thank him for his continued support of NRR next time you work him! Thank you for participating in NRR 2018! Click Here to Read the 2018 NRR SOAPBOX! Steve VE7SL's entertaining "Amateur Radio.com" article featuring the rigs he encountered during NRR 2018. Congratulations to EVERYONE who participates and a HUGE thank you to those who sent in an entry! Have you found the Novice Rig Roundup events fun and worthwhile? Would you like to help defray the costs of putting on this event, the awards and the web site? Please contact us via e-mail if you have a company that would like to help sponsor future NRR events. older novice era equipment, please make a contribution. Any amount is appreciated.